Listening to the tired liberal cant of Fleetwood Mac’s new album, Say You Will, it may be hard even for fellow travelers to disagree with the Australian newspaper columnist who recently called the war with Iraq the “Vietnam of the left.” Surely, no one, not even fans, looks to Fleetwood Mac for Foreign Affairs–style insight. This is a band, after all, that has made great albums about divorce, not geopolitics. Yet the prepackaged pacifism of the not-quite-reunited Mac (Christine McVie wisely sat this one out) says much about the left’s ideological quagmire, one marked by a reflexive distrust of the media and American power. Another Say You Will song posits an even more contentious idea: that the quality of American journalism is so low that “Murrow [is] Turning Over in His Grave.” Granted, Geraldo Rivera and Peter Arnett are totally embarrassing. And Eason Jordan’s confession that CNN stayed mum on Iraqi atrocities says frightening things about the accommodations news organizations make to report from totalitarian states. But like fellow celeb Janeane Garofalo, the members of Fleetwood Mac seem to live in a less complex media moment of the past, one without Al Jazeera and Weblogs. If they bothered to look, they’d find plenty of heirs to Murrow, including John F. Burns, Anthony Shadid, and the late Daniel Pearl—who just received the 2003 Edward R. Murrow Award—to name just a few. Fleetwood Mac’s politics wouldn’t be so hard to swallow if its music—Adult Appalachia—weren’t so affectless. After all, Public Enemy turned some of the most heinous politics this side of David Duke into compelling hip-hop. And on its single “Peacekeeper,” the band comes up with an unintentional howler that sinks any chance of our taking it seriously. “Peacekeeper, take your time,” the Mac sings, as if a certain international body’s foot-dragging hadn’t helped us get into war in the first place. 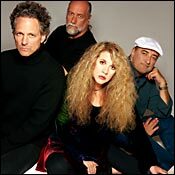 There’s something honorable about Fleetwood Mac’s going ahead with the release of Say You Will even as its outdated take on the world proves so very wrong. The same cannot be said of Madonna, whose American Life is a retread of the vocoder disco and trance (“X-Static Process”) and awkward confessionals (“Mother and Father”) of recent albums like Music and Ray of Light. When Dresden-like civilian casualties failed to materialize during the war with Iraq, Madonna pulled the album’s Bush-taunting, blood-and-guts title video. Civilian casualties and quagmires—they’re just so March. Liberation is totally April. Pop stars like Madonna always cast their most critical eye on the easiest of targets: America. Too bad we’re not as evil as they’d hoped. We Are Getting Bad (Motion).